For many people, Thanksgiving is all about excess. Yet this can have a negative impact on the environment. 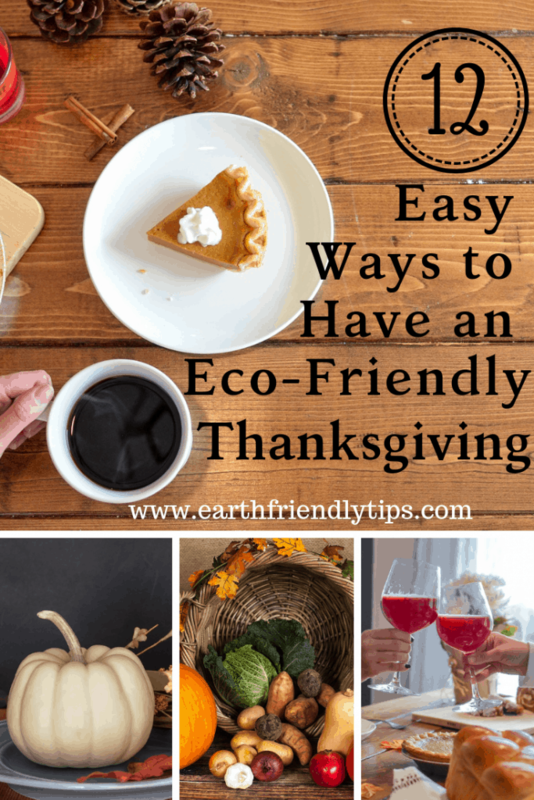 Fortunately, if you follow these easy tips, you can have an eco-friendly Thanksgiving and still enjoy all of your favorite traditions. Even better, many of these tips will actually help you save some money! One of the easiest ways to enjoy an eco-friendly Thanksgiving is to buy locally grown foods. After you’ve made your list of produce that you need, head to your local farmers’ market. When you shop local, you’ll enjoy a number of benefits. First, you help create jobs in your community. You also help preserve farmland, which improves the environment. You have a smaller carbon footprint since you’re not purchasing produce that has been shipped across the country. Finally, you’re feeding your family fresh and healthy food. When you get your produce home, don’t forget to use a homemade fruit and veggie cleaner to help get everything clean. While you should aim to get as much produce and other fixings for your Thanksgiving dinner from the farmers’ market, you’ll likely have some things you need to get from the grocery store. When you go grocery shopping, look for products that come in packaging you can recycle, such as cardboard boxes, recyclable plastic, tin or aluminum cans, and glass bottles and jars. The more you can recycle, the more you can cut down on packaging that ends up in the landfill. Although you might be tempted to buy disposable plates and utensils to keep clean up at a minimum, that will lead to plenty of excess waste. Instead, use real plates and utensils for your meals. If you have good china, Thanksgiving is the perfect excuse to use it. Also, don’t forget to use cloth napkins instead of paper ones. On the other hand, if you must use disposable dishes, you can get compostable plates and biodegradable utensils. According to the EPA, 22 percent of trash in our landfills is food waste. 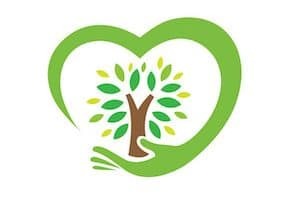 Simply composting your food scraps rather than throwing them away not only helps conserve space in our landfills, but it also helps cut down on the amount of methane gas released into our air. When food goes to the landfill, the nutrients never return to the soil. Instead, it simply rots and produces methane gas. Instead of buying cheap decorations made of petroleum-based plastic that can emit harmful gases, take a look at the beauty outside to see what you can use. For example, you can fill glass vases with leaves, pine cones, and acorns for a festive table centerpiece. You can also get creative and use pine cones to make place card holders. Like most people, you’ll probably end up with leftovers after your Thanksgiving meal. Instead of using plastic containers that can secrete harmful chemicals into your food, opt for glass storage containers that are safer and can be used again and again. Also, skip the disposable food wrap that ends up in the landfill and wrap up leftovers using natural and reusable food wrap. If you’re going to another home for Thanksgiving, don’t forget to bring your own reusable containers for your leftovers. Obviously reducing your plastic use is a big part of having not just an eco-friendly Thanksgiving, but an eco-friendly life as well. In addition to choosing reusable containers for your leftovers, there are several other steps you can take to reduce plastic use. For example, when you shop for the food you need for your Thanksgiving meal, don’t forget to bring your reusable shopping bags along so you don’t need to use any plastic bags. You can also serve tap water instead of bottled water. In today’s society, many families are spread across the country, and holidays like Thanksgiving are one of the few times everyone can get together. Unfortunately, all those cars and planes taking people to see family really rack up the carbon emissions. If everyone in your family is traveling to one house for the holiday, try to coordinate carpools so fewer cars are on the road and less emissions get released into the atmosphere. If you’ll be cooking several dishes in the oven, you can conserve energy by putting them in at the same time. Multiple dishes in the oven take about 15 percent longer to cook, so you’ll need to bump up your cooking time a little. Also, keep in mind that while meat and casseroles are pretty flexible with their temperatures, baked goods are not. Therefore, you need to set the oven at the temperature for the baked good, and then simply reduce or increase the cooking time for the other items. Another good way to have an eco-friendly Thanksgiving and conserve energy is to turn off your furnace when you’re cooking, and then let the heat from the oven warm your house. Yes, disposable roasting pans are convenient. However, they’re also very bad for the environment. Instead of buying a roasting pan that you use once and throw away, look into a quality roasting pan that will last you a lifetime. Once your meal is over and it’s time to clean up, you can continue having an eco-friendly Thanksgiving by avoiding the harsh and dangerous chemicals in conventional cleaners and using some natural alternatives that are better for the environment and everyone in your home. Clean up any spills on your floors with a homemade hardwood floor cleaner or laminate floor cleaner. Wipe up your countertops with a safe granite cleaner. 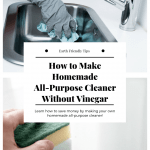 Or simply take care of everything at once with an all-purpose cleaner that doesn’t use vinegar. Although you might not look at a plant-based Thanksgiving as traditional, it is one change that will have a significant positive impact on the environment. While a turkey doesn’t have the worst carbon footprint, consuming two 3.5-ounce servings of the bird is just like driving 6 miles in your car. On the other hand, having a cup of broccoli is like driving only a half a mile. If you think your Thanksgiving won’t be the same without meat, think again! You can serve some of these delicious vegan Thanksgiving recipes and still please everyone at your table. Of course, if you simply can’t live without your turkey this Thanksgiving, you can make a sustainable and ethical choice by looking for one that’s organic and pasture raised. 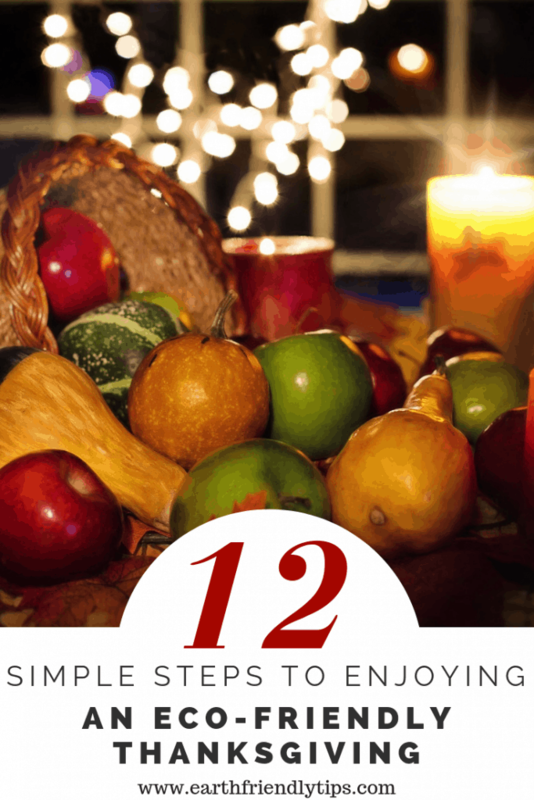 If you’re interested in celebrating a more eco-friendly Thanksgiving this year, you can follow these easy steps to cut down on waste, conserve resources, and still enjoy all of your favorite traditions. 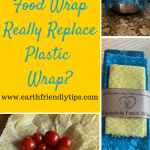 Next Next post: What Is Reusable Food Wrap?